The scar is geometrically excised or re-orientated. Techniques such as dermabrasion may be used to flatten the scar. Fine sutures are used to close the skin. Scar revision is designed to improve or disguise the appearance of an existing scar. Scars tend to improve on their own with time and therefore surgery to revise a scar is not usually carried out for at least six months after the original injury or operation. Scar revisions can be carried out under either general anaesthesia (ie you are put to sleep completely) or local anaesthesia (an injection to make the area numb). Scar revision is not a particularly painful operation although it might be necessary for you to take simple painkillers (eg Ibuprofen) afterwards. The discomfort is usually worse for the first few days although it may take a week or so to completely disappear. If Dr Andi feels that infection may be a problem you will be given a course of antibiotics. Swelling and bruising is variable and is generally worse for the first few days after the operation. The swelling can be reduced by using cold compresses and sleeping propped upright. Some oozing from the wound is not uncommon in the first day or so after surgery. If bleeding is a problem when you get home it can usually be stopped by applying pressure over the area for at least 10 minutes with a clean handkerchief or swab. Infection is uncommon particularly if antibiotics have been prescribed. 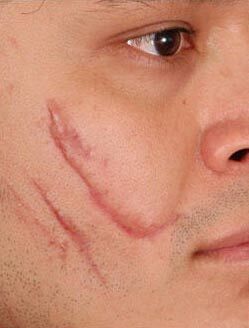 It is usual for a scar revision to appear red for several weeks after surgery. Even in the best hands unsightly scars can reappear despite scar revision. If Mr Andi thinks this might happen to you additional forms of treatment may be suggested (eg silicon dressings or steroid injections into the scar). There are many different types of facial scar and treatments vary according to the type and size of the scar. Some scars are cut out and restitched carefully. 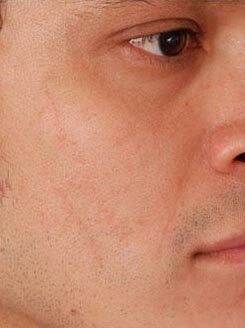 Other scars are removed by abrasion or laser surgery and require no stitching. If the surgery is carried out under local anaesthesia you will not stay in hospital. If a general anaesthetic is necessary you might need to stay in hospital overnight. This varies enormously from person to person and also depends on what type of job you do. Most people require a couple of days off work. You should remember that you cannot drive or operate machinery for 48 hours after a general anaesthetic. Taking care of the wound after scar revision is very important. A dressing may be put over the wound after the surgery. You need to keep the wound dry until the stitches have been removed or until you have been advised by your surgeon that it is alright to wash the wound. Stitches are usually after a week. Depending on the type of scar it may be necessary to continue dressing the wound after the stitches have been removed.